Running either UserDSDT or Easybeast with Multibeast will automatically identify your computer as a 2008 Mac Pro, because the Mac Pro (3,1) system definition is installed by default. 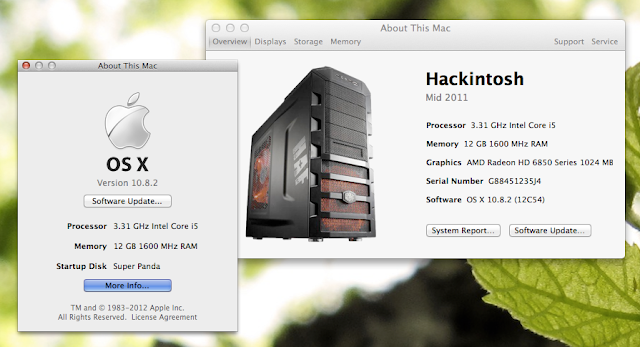 To recap, system definitions pretend that your Hackintosh is a real Mac, enabling a variety of model-specific features in Mac OS X. However, if you don't think that your "About This Mac" page is glamorous enough, it's actually possible to edit this system definition information. NOTE: In the CoreServices folder, you will have to right-click the file "CoreTypes.bundle" and click "Show Package Contents". Once you reach this "Resources" folders, you'll be able to get large, HD icons for various Apple products, including Macs, iPhones, iPads, and more. Each of these icons is 512x512 in size. 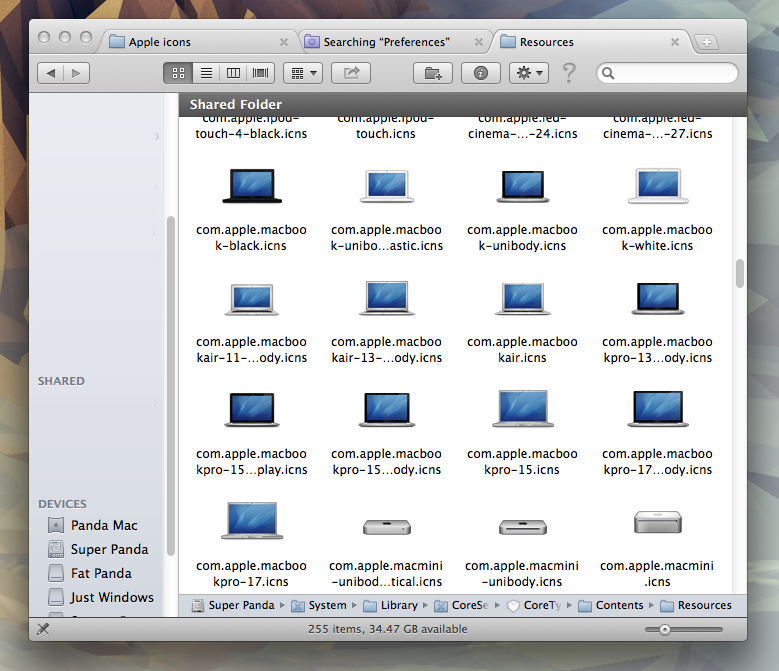 Find the icon that your "About This Mac" page is currently using. You can either delete this icon, or drag it out to your desktop (or somewhere else random) as a backup. Next, find an image that you want to use on your "About This Mac" page instead. It should be at least 256x256 in size. The image should also be transparent, which means that the background of the image has to be blank (not just white in color). If you know how to, you can also make your own transparent image. For reference, this is the image that I'm currently using. 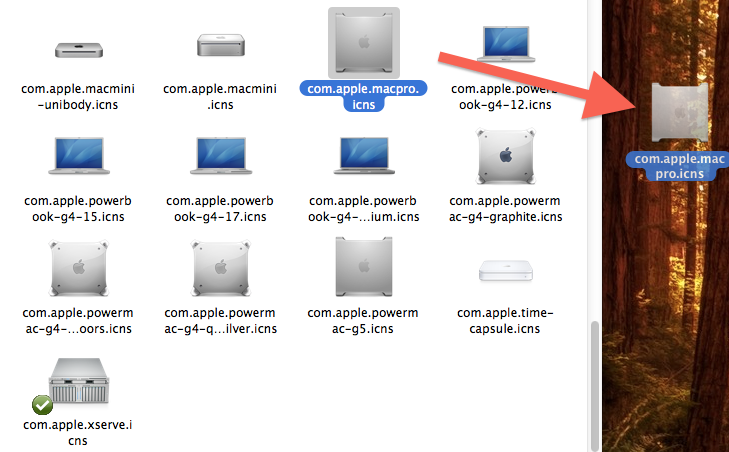 Mac OS X uses the .icns format for its icons, instead of normal image formats like PNG or GIF. To fix this, once you have an image prepared, go to iConvertIcons.com, and choose the "Use Online" option. 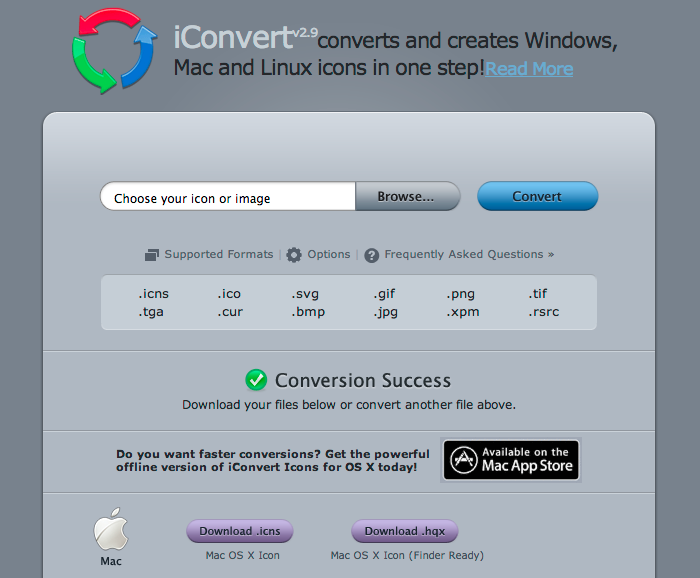 Upload your image, and click "Convert". Once the website finishes converting your file, click "Download .icns" to download the .icns version of your image. Rename your new icon to the name of the old icon that you dragged out from the "Resources" folder earlier. If you're using the default Mac Pro (3,1) system definition, you'll rename your new icon to "com.apple.macpro.icns" (without quotation marks). 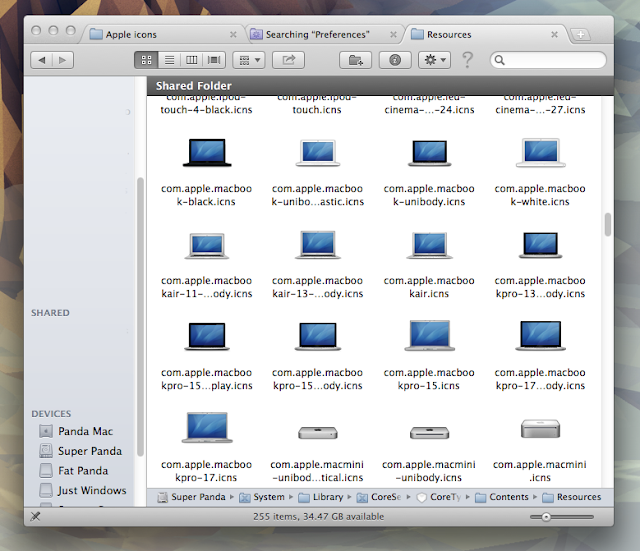 Finally, drag your new icon into the Resources folder, and log out. You're done! 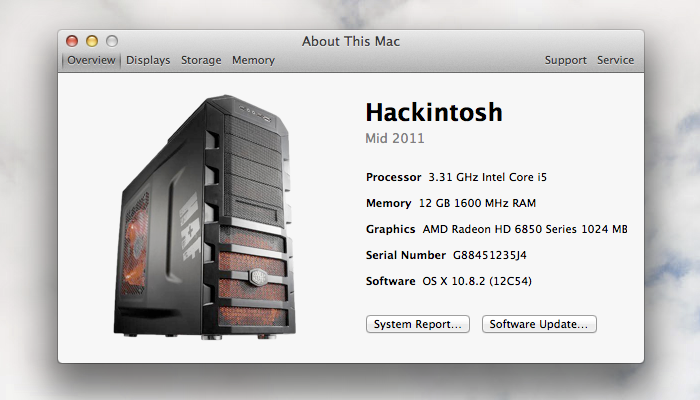 By default, "About This Mac" calls your Hackintosh a Mac. For instance, if you have the Mac Pro (3,1) system definition installed, "About This Mac" will say "Mac Pro Early 2008". 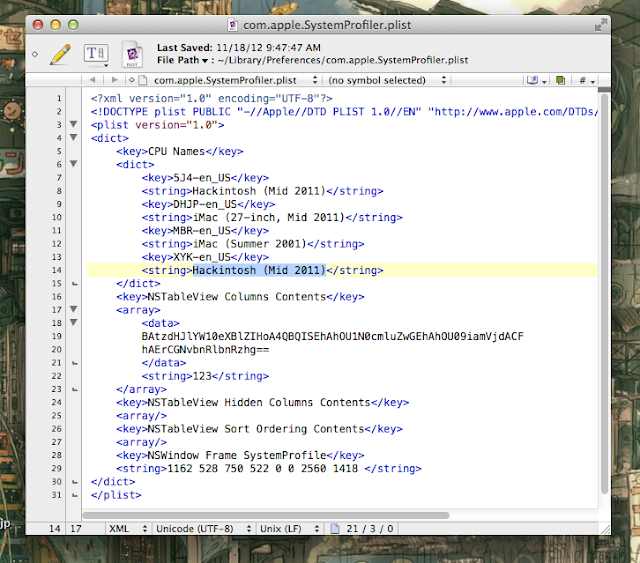 You can change this by editing a properties list (plist) inside Mac OS X. First off, download TextWrangler. The plist file that you need to edit for this cannot be rendered properly in TextEdit or most other text editors. NOTE: "Your User" represents the name of your user account in Mac OS X. To open hidden folders, you may have to right-click the folder and click "Open". 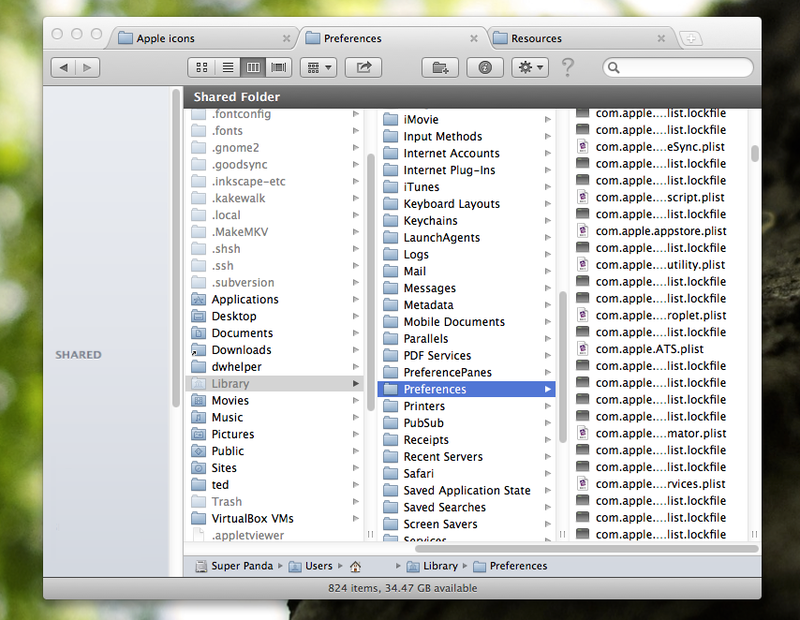 Inside the "Preferences" folder, search for the file "com.apple.SystemProfiler.plist" (without the quotation marks). Open this file with TextWrangler. The exact composition of your plist file depends on which system definition you're using. Replace the appropriate names with the names that you wish to use instead. 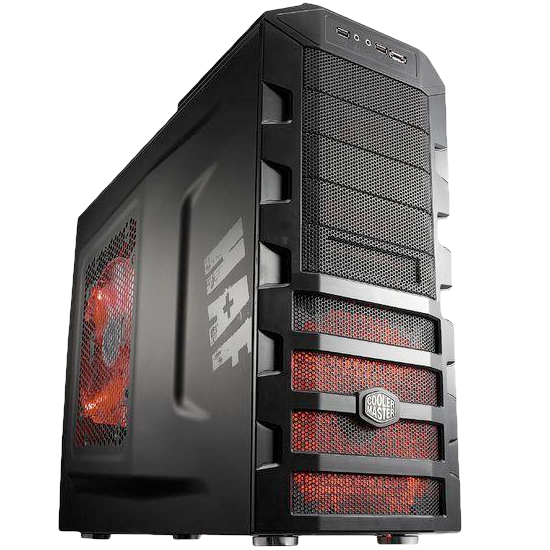 For instance, if you're using the Mac Pro (3,1) definition, replace "Mac Pro (Early 2008)" with "Hackintosh (Early 2011)" or whatever else you want the name to be. You may have to replace multiple instances of each name. Save the file, and log out. You're done! Once you log back in, click the Apple on the upper left-hand corner of your screen, click "About This Mac", and then click "More Info". You will now see your new icon and system name displayed. Hooray! This is a purely cosmetic change; as far as Mac OS X is concerned, you're still using a normal system definition. Your "About This Mac" page simply looks better. But a little flare never hurt anybody, after all.